Emperor Meiji (明治天皇, Meiji-tennō, 3 November 1852 – 30 July 1912), or Meiji the Great (明治大帝, Meiji-taitei) was the 122nd Emperor of Japan according to the traditional order of succession, reigning from 3 February 1867 until his death on 30 July 1912. He presided over the Meiji period, a time of rapid change that witnessed the Empire of Japan rapidly transform from an isolationist feudal state to an industrialized world power. At the time of Emperor Meiji's birth in 1852, Japan was an isolated, pre-industrial, feudal country dominated by the Tokugawa shogunate and the daimyōs, who ruled over the country's more than 250 decentralized domains. By the time of his death in 1912, Japan had undergone an extensive political, economic, and social revolution and emerged as one of the great powers on the world stage. The New York Times summed up this transformation at the Emperor's funeral in 1912 with the words: "the contrast between that which preceded the funeral car and that which followed it was striking indeed. Before it went old Japan; after it came new Japan." Since the modern era, when an Emperor of Japan dies they are given a posthumous name. Such a name is a combination of the era of which they reigned and coincides with the Emperor's contribution to the throne whilst they were alive. Therefore, while publicly known during his life merely as "The Emperor", he is historically known as "Emperor Meiji" after his death. He obtained this current title in reference to the Meiji period which spanned almost the entirety of his reign. His personal name (which is not used in any formal or official context, except for his signature) was Mutsuhito (睦仁). The Tokugawa shogunate had established itself in the early 17th century. Under its rule, the shōgun governed Japan. About 180 lords, known as daimyōs, ruled autonomous realms under the shōgun, and occasionally the shōgun called upon the daimyōs for gifts but did not tax them. The shōgun controlled the daimyōs in other ways too; only the shōgun could approve daimyōs marriages, and the shōgun could divest a daimyō of his lands. Tokugawa Ieyasu, who had officially retired from his position by 1605, was the first Tokugawa shōgun. Upon retirement, Tokugawa Ieyasu and his son Tokugawa Hidetada, the titular shōgun, issued a code of behavior for the nobility in 1605. Under the code, the Emperor was required to devote his time to scholarship and the arts. The Emperors under the shogunate appear to have adhered closely to this code by studying Confucian classics and devoting time to poetry and calligraphy. Emperors were only taught the rudiments of Japanese and Chinese history and geography. The shōgun did not seek the consent or advice of the Emperor for his actions. Emperors almost never left their palace compound, or Gosho in Kyoto, except after an Emperor retired or to take shelter in a temple if the palace caught on fire. Few Emperors lived long enough to retire; of the Meiji Emperor's five predecessors, only his grandfather lived into his forties, dying aged forty-six. The Imperial Family suffered very high rates of infant mortality; all five of the Emperor's brothers and sisters died as infants, and only five of his own fifteen children reached adulthood. Soon after taking control in the early seventeenth century, shogunate officials (known generically as bakufu) ended much Western trade with Japan, and barred missionaries from the islands. In addition to the substantial Chinese trade, only the Dutch continued trade with Japan, maintaining a post on the island of Dejima by Nagasaki. However, by the early 19th century, European and American vessels appeared in the waters around Japan with increasing frequency. Prince Mutsuhito was born on November 3, 1852 in a small house on his maternal grandfather's property at the north end of the Gosho. At the time, birth was culturally believed to be source of pollution, so the imperial prince was not born in the Palace. Instead, it was common for members of the Imperial Family to be born in a structure, often temporary, near the pregnant woman's father's house. The Prince Mutsuhito's mother, Nakayama Yoshiko, was a concubine (gon no tenji) to his father Emperor Kōmei, and she was the daughter of the acting major counselor, Nakayama Tadayasu. The young prince was given the name Sachinomiya, or Prince Sachi. The young prince was born into an era of great change in Japan. This change was symbolised dramatically in July 1853 when Commodore Matthew Perry and his American Naval squadron (what the Japanese dubbed "the Black Ships"), sailed into the harbour at Edo (known since 1868 as Tokyo). Perry sought to open Japan up to international trade and warned the Japanese of military consequences if they did not agree. For the first time in at least 250 years, the shogunate took the highly unusual step of consulting with the Imperial Court because of the crisis brought on by Perry's arrival. Emperor Kōmei's officials advised that they felt they should agree to trade with the Americans and asked that they be informed in advance of any steps to be taken upon Perry's return. The Japanese government decided that their military was no match for the American military and thus allowed trade and submitted to what it dubbed the "Unequal Treaties." "Unequal Treaties" meant giving up tariff authority and the right to try foreigners in its own courts. The shogunate's willingness to consult with the Court was short-lived: in 1858, word of a treaty arrived with a letter stating that due to shortness of time, it had not been possible to consult. Emperor Kōmei was so incensed that he threatened to abdicate—though even this action would have required the consent of the shōgun. Much of the Emperor's boyhood is known only through later accounts, which his biographer Donald Keene points out are often contradictory. One contemporary described Mutsuhito as healthy and strong, somewhat of a bully, and exceptionally talented at sumo. Another states that the prince was delicate and often ill. Some biographers state that he fainted when he first heard gunfire, while others deny this account. On August 16, 1860, Sachinomiya was proclaimed prince of the blood and heir to the throne and was formally adopted by his father's consort. Later that year on November 11, he was proclaimed as the crown prince and given an adult name, Mutsuhito. The prince began his education at the age of seven. He proved an indifferent student, and later in life wrote poems regretting that he had not applied himself more in writing practice. By the early 1860s, the shogunate was under several threats. Representatives of foreign powers sought to increase their influence in Japan. Many daimyōs were increasingly dissatisfied with bakufu handling foreign affairs. Large numbers of young samurai, known as shishi or "men of high purpose", began to meet and speak against the shogunate. The shishi revered Emperor Kōmei and favoured direct violent action to cure societal ills. While they initially desired the death or expulsion of all foreigners, the shishi would later begin to advocate the modernisation of the country. The bakufu enacted several measures to appease the various groups in an effort to drive a wedge between the shishi and daimyōs. Kyoto was a major centre for the shishi and the shishi had influence over the Emperor Kōmei. In 1863, the shishi persuaded him to issue an "Order to expel barbarians". The Order placed the shogunate in a difficult position since they no intention of enforcing the order because they did not have the power to carry it out. Several attacks were made on foreigners or their ships, and foreign forces retaliated. Bakufu forces were able to drive most of the shishi out of Kyoto, and an attempt by them to return in 1864 was driven back. Nevertheless, unrest continued throughout Japan. The prince's awareness of the political turmoil is uncertain. During this time, he studied waka poetry, first with his father, then with the court poets. In 1866, a new shōgun, Tokugawa Yoshinobu, took office as the prince continued his classical education. Tokugawa Yoshinobu was a reformer who desired to transform Japan into a Western-style state. Yoshinobu was the final shōgun and met with resistance from among the bakufu, even as unrest and military actions continued. In mid-1866, a bakufu army set forth to punish rebels in southern Japan. The army was defeated. Emperor Kōmei had always enjoyed excellent health, and was only 36 years old in January 1867. In that month, however, he fell seriously ill. Though he appeared to make some recovery, he suddenly worsened and died on January 30. British diplomat Sir Ernest Satow wrote, "it is impossible to deny that [Emperor Kōmei's] disappearance from the political scene, leaving as his successor a boy of fifteen or sixteen [actually fourteen], was most opportune". In a brief ceremony in Kyoto, the crown prince formally ascended to the throne on February 3, 1867. The new Emperor continued his classical education, which did not include matters of politics. In the meantime, the shōgun, Yoshinobu, struggled to maintain power. He repeatedly asked for the Emperor's confirmation of his actions, which he eventually received, but there is no indication that the young Emperor was himself involved in the decisions. The shishi and other rebels continued to shape their vision of the new Japan, and although they revered the Emperor, they had no thought of having him play an active part in the political process. The Emperor of Japan announces to the sovereigns of all foreign countries and to their subjects that permission has been granted to the shōgun Tokugawa Yoshinobu to return the governing power in accordance with his own request. We shall henceforward exercise supreme authority in all the internal and external affairs of the country. Consequently, the title of Emperor must be substituted for that of Tycoon, in which the treaties have been made. Officers are being appointed by us to the conduct of foreign affairs. It is desirable that the representatives of the treaty powers recognize this announcement. Yoshinobu resisted only briefly, but it was not until late 1869 that the final bakufu holdouts were finally defeated. In the ninth month of the following year, the era was changed to Meiji, or "enlightened rule", which was later used for the Emperor's posthumous name. This marked the beginning of the custom of posthumously naming the Emperor after the era during which he ruled. Despite the ouster of the bakufu, no effective central government had been put in place by the rebels. On March 23, foreign envoys were first permitted to visit Kyoto and pay formal calls on the Emperor. On April 7, 1868, the Emperor was presented with the Charter Oath, a five-point statement of the nature of the new government. The statement was designed to win over those who had not yet committed themselves to the new regime. This document, which the Emperor then formally promoted, abolished feudalism and proclaimed a modern democratic government for Japan. The Charter Oath would later be cited by Emperor Hirohito in the Humanity Declaration as support for the imposed changes in Japanese government following World War II. For the first time since early childhood, he left the Imperial precincts in Kyoto in mid-May to take command of the forces pursuing the remnants of the bakufu armies. Traveling in slow stages due to through roads being lined with crowds, he took three days to travel from Kyoto to Osaka. There was no conflict in Osaka; the new leaders wanted the Emperor to be more visible to his people and to foreign envoys. At the end of May, after two weeks in Osaka (in a much less formal atmosphere than in Kyoto), the Emperor returned to his home. Shortly after his return, it was announced that the Emperor would begin to preside over all state business, reserving further literary study for his leisure time. Only from 1871 onward did the Emperor's studies include materials on contemporary affairs. On September 19, 1868, the Emperor announced the name of the city of Edo was to be changed to Tokyo, meaning "eastern capital". He was formally crowned in Kyoto on October 15 (a ceremony which had been postponed from the previous year due to the civil unrest). Shortly before the coronation, he announced that the new era, or nengō, would be called Meiji or "enlightened rule". Heretofore the nengō had often been changed multiple times in an Emperor's reign; from now on, it was announced, there would only be one nengō per reign. Soon after his coronation, the Emperor journeyed to Tokyo by road, visiting it for the first time. He arrived in late November and began an extended stay by distributing sake among the population. The population of Tokyo was eager for an Imperial visit. Tokyo had been the site of the shōgun's court and the city's population feared that with the abolition of the shogunate, the city might fall into decline. It would not be until 1889 that a final decision was made to move the capital to Tokyo. While in Tokyo, the Emperor boarded a Japanese naval vessel for the first time, and the following day gave instructions for studies to see how Japan's navy could be strengthened. Soon after his return to Kyoto, a rescript was issued in the Emperor's name (but most likely written by court officials). It indicated his intent to be involved in government affairs. And indeed he attended cabinet meetings and innumerable other government functions, though rarely speaking, almost until the day of his death. The successful revolutionaries organized themselves into a Council of State, and subsequently into a system where three main ministers led the government. This structure would last until the establishment of a prime minister, who would lead a cabinet in a western fashion, in 1885. Initially, not even the retention of the Emperor was certain; revolutionary leader Gotō Shōjirō later stated that some officials "were afraid the extremists might go further and abolish the Mikado". Japan's new leaders sought to reform the patchwork system of domains governed by the daimyōs. 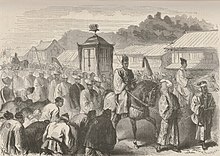 In 1869, several of the daimyōs who had supported the revolution gave their land property to the Emperor and were reappointed as governors, with considerable salaries. By the following year, all other daimyōs had followed suit. In 1871, as Japan was organized into 72 prefectures the Emperor announced that domains were entirely abolished. The daimyōs were compensated with annual salaries equal to ten percent of their former revenues (from which they now did not have to deduct the cost of governing), but were required to move to the new capital, Tokyo. Most daimyōs retired from politics. The new administration gradually abolished most privileges of the samurai, including their right to a stipend from the government. However, unlike the daimyōs, many samurai suffered financially from this change. Most other class-based distinctions were abolished. Legalized discrimination against the burakumin ended. However, these classes continue to suffer discrimination in Japan to the present time. Although a new parliament was formed, it had no real power, and neither did the Emperor. Power had passed from the Tokugawa into the hands of those daimyōs and other samurai who had led the Restoration. Japan was thus controlled by the Genrō, an oligarchy which comprised the most powerful men of the military, political and economic spheres. The Emperor, if nothing else, showed greater political longevity than his recent predecessors, as he was the first Japanese monarch to remain on the throne past the age of 50 since the abdication of Emperor Ōgimachi in 1586. The Japanese take pride in the Meiji Restoration, as it and the accompanying industrialization allowed Japan to become the preeminent power in the Pacific and a major player in the world within a generation. Yet, Emperor Meiji's role in the Restoration, as well as the amount of personal authority and influence he wielded during his reign, remains debatable. He kept no diary, wrote almost no letters (unlike his father) and left "no more than three or four" photographs. The accounts of people who had met or were close to him usually contain little substantial information or are mutually contradictory. Some call him an autocrat, while others believe that his role was merely symbolic, without real power (even this symbolic role was shaped by others) and that he rarely interfered with what had been agreed upon in advance by the ruling politicians and officers. Others contend that he was never a full dictator, but whether his personal power was "far closer to the absolutist end" or that he was the key mediator in a collective leadership (and thus, Meiji, "whilst never a great leader in the Western sense, was indisputably of great importance in the workings of Japanese consensus politics"), or that he was in any case no mere cipher, but his actual influence varied depending on different stages of his reign and the lack of sources makes it nigh-impossible to actually penetrate the mysteries surrounding his role and personality., is a matter of debate. R.Starr describes him as a highly individualistic and forthright person who was no puppet to any group in his government, and although progressive, not 'liberal' or 'democratic'. This poem was later recited by his grandson, Emperor Shōwa (Hirohito), in an Imperial Conference in September 1941. Near the end of his life several anarchists, including Shūsui Kōtoku, were executed (1911) on charges of having conspired to murder the sovereign. This conspiracy was known as the High Treason Incident (1910). Emperor Meiji, suffering from diabetes, nephritis, and gastroenteritis, died of uremia. Although the official announcement said he died at 00:42 on July 30, 1912, the actual death was at 22:40 on July 29. After the Emperor's death in 1912, the Japanese Diet passed a resolution to commemorate his role in the Meiji Restoration. An iris garden in an area of Tokyo where Emperor Meiji and the Empress had been known to visit was chosen as the building's location for the Shinto shrine Meiji Jingū. The shrine does not contain the Emperor's grave, which is at Fushimi-momoyama south of Kyoto. Unknown to him at the time, Meiji also had hereditary diseases that were the result of inbreeding. These genetic defects included but were not limited to Prognathism and Spinal deformation, which could also be found in his children. Emperor Meiji is portrayed by Toshirō Mifune in the 1980 Japanese war drama film The Battle of Port Arthur (sometimes referred as 203 Kochi). Directed by Toshio Masuda, the film depicted the Siege of Port Arthur during the Russo-Japanese War, and also starred Tatsuya Nakadai (as General Nogi Maresuke), and Tetsurō Tamba (as General Kodama Gentarō). Emperor Meiji also appears in the 2003 film The Last Samurai, portrayed by Nakamura Shichinosuke II. In the film The Last Samurai the Emperor is represented as a weak, easy to handle man without hinting at the risk of coup d'etat, having the pressure of the rebel shogunates that had economic interests with the United States. The Emperor's determination is only shown at the end of the movie when he enforces his ideas by breaking the treaty with the Americans, after consolidating his power after the battle. Soon after Meiji's accession, the Emperor's officials presented Ichijō Haruko to him as a possible bride. The future Empress was the daughter of an Imperial official, and was three years older than the groom, who would have to wait to wed until after his genpuku (manhood ceremony). The two married on January 11, 1869. Known posthumously as Empress Shōken, she was the first Imperial Consort to receive the title of kōgō (literally, the Emperor's wife, translated as Empress Consort), in several hundred years. Although she was the first Japanese Empress Consort to play a public role, she bore no children. However, the Meiji Emperor had fifteen children by five official ladies-in-waiting. Only five of his children, a prince born to Lady Naruko (1855–1943), the daughter of Yanagiwara Mitsunaru, and four princesses born to Lady Sachiko (1867–1947), the eldest daughter of Count Sono Motosachi, lived to adulthood. Although Meiji was the last Emperor to have concubines, this function was not officially abolished until 1924. November 3, 1852: Emperor Meiji (then known as Sachinomiya) is born to the imperial concubine Nakayama Yoshiko and Emperor Kōmei. 1853: A fleet of ships headed by Commodore Matthew Perry arrives in Japan on July 8. Death of the shōgun Tokugawa Ieyoshi; appointment of Tokugawa Iesada as shōgun. 1854–55: Treaties are signed with the United States by the shogunate. Late 1850s–1860s: The "Sonnō jōi" movement is in full force. 1858: The shogunate signs treaties with the Netherlands, Imperial Russia, and Great Britain. Death of the shōgun Tokugawa Iesada; appointment of Tokugawa Iemochi as shōgun. March 1860: The Tairō, Ii Naosuke, is assassinated in the Sakuradamon incident. November 11: Sachinomiya is formally proclaimed Crown Prince and given the personal name Mutsuhito. 1866: Death of the shōgun Tokugawa Iemochi; appointment of Tokugawa Yoshinobu as shōgun. January 31, 1867: Death of Emperor Kōmei from hemorrhagic smallpox, unofficial accession of Mutsuhito to the throne. January 4, 1868: Formal restoration of imperial rule; end of 265 years of rule by the Tokugawa shogunate. September 12: Formal enthronement of the Emperor. November 6: The capital is moved from Kyoto to Edo, renamed Tokyo. November 5, 1872: The Emperor receives the Grand Duke Alexei Alexandrovich of Russia. January 11, 1869: Marriage of the Emperor to Ichijo Haruko, thenceforth the Empress Shōken. 1871: The abolition of the han system is proclaimed. 1873: Edo Castle is destroyed in a conflagration; the Emperor moves to the Akasaka Palace. His first children are born, but die at birth. August 31, 1879: Prince Yoshihito, the future Emperor Taishō and the Emperor's only surviving son, is born. 1881: Receives the first state visit of a foreign monarch, King Kalākaua of Hawaii. 1889: Meiji Constitution promulgated; Itō Hirobumi becomes first Prime Minister of Japan. 1894: Sino-Japanese War; Japanese victory establishes Japan as a regional power. 1901: Became grandfather when Emperor Taishō's son, the future Emperor Shōwa was born. 1904–1905: Russo-Japanese War; Japanese victory earns Japan the status of a great power. 1910: The Annexation of Korea by the Empire of Japan. Chiefs of sixteen countries in a gathering envisage a desirable future world. Emperor Meiji featured on the 1905 New-York Tribune cover as the "beloved ruler of a new world power". ^ a b "The Funeral Ceremonies of Meiji Tenno", reprinted from the Japan Advertiser Article 8—No Title], New York Times. October 13, 1912. ^ Keene, Donald (2005). Emperor of Japan : Meiji and his world, 1852-1912. Columbia University Press. p. 18. ISBN 0231123418. OCLC 1059567148. ^ Keene, Donald (2005). Emperor of Japan : Meiji and his world, 1852-1912. Columbia University Press. ISBN 0231123418. OCLC 1059567148. ^ Gordon, Andrew (2003). A modern history of Japan : from Tokugawa times to the present. Oxford University Press. pp. 51–52. ISBN 0195110609. OCLC 49704795. ^ Keene, Donald (2005). Emperor of Japan: Meiji and his world, 1852-1912. New York; Chichester: Columbia University Press. p. 18. ISBN 9780231123419. OCLC 1059567148. ^ Bix, Herbert P. (2001). Hirohito and the making of modern Japan (Book) (1st Perennial ed.). New York: Perennial. p. 29. ISBN 978-0060931308. ^ Baxter, James C. (1994). The Meiji Unification Through the Lens of Ishikawa Prefecture. p. 4. ISBN 9780674564664. ^ Takahashi, Hiroshi (2008). "Akihito and the Problem of Succession". In Shillony, Ben-Ami (ed.). The Emperors of Modern Japan Check |url= value (help). BRILL. p. 2, 139. ISBN 9789004168220. ^ Miyoshi, Masao (1991). Off Center: Power and Culture Relations Between Japan and the United States Front Cover. Harvard University Press. p. 170. ISBN 9780674631762. Retrieved 25 November 2018. ^ Connors, Lesley (2010). The Emperor's Adviser: Saionji Kinmochi and Pre-War Japanese Politics. Routledge. p. 58. ISBN 9781136900235. Retrieved 25 November 2018. ^ Starrs, R. (2011). Politics and Religion in Modern Japan: Red Sun, White Lotus. Springer. pp. 71–73. ISBN 9780230336681. Retrieved 25 November 2018. ^ a b c "Archived copy". Archived from the original on December 29, 2016. Retrieved December 3, 2016. CS1 maint: Archived copy as title (link) "Historical Events Today: 1867 - Prince Mutsuhito, 14, becomes Emperor Meiji of Japan (1867-1912). ^ Takashi, Fujitani (1998). Splendid monarchy: power and pageantry in modern Japan. University of California Press. p. 145. ISBN 978-0-520-21371-5. ^ "広報 No.589 明治の終幕" (PDF) (in Japanese). Sannohe town hall. Retrieved May 18, 2011. ^ Adika, Alon (3 August 2013). "The Emperor and the general: a visit to Fushimi Momoyama". The Japan Times Online. Retrieved 22 February 2019. ^ Considered by German Japanologist Johannes Justus Rein and described by Francis L. Hawks and Commodore Matthew Perry in their 1856 work, Narrative of the Expedition of an American Squadron to the China Seas and Japan Performed in the Years 1852, 1853 and 1854 under the Command of Commodore M.C. Perry, United States Navy., as the "Opening" of Japan. Wikimedia Commons has media related to Meiji Emperor. "Mutsu Hito" . Encyclopædia Britannica (11th ed.). 1911.